What's up with advertising copy cats in Lebanon? As soon as one advertisement catches on, the whole advertising industry follows its footsteps. Can someone PLEASE explain to me what's the message behind a fashionable woman shopping for ... groceries?! 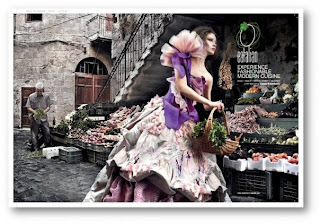 We have seen it for Eatalian ("fashionable modern cuisine", is it? 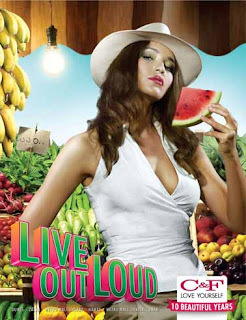 ), C & F (perfumes and cosmetics) with the message "live out loud", and for yet another Italian fashion brand *which name I cannot recall* (the unipole was located around Sin el Fil- Baouchrieh). Did anyone else pick this trend up? 2 billboards do not constitute a trend. - For Eatalian: it is a fashionable restaurant and if you go have dinner in it sometime you will see that it does not look like a traditional italian restaurant. they linked a fashionable restaurant with fashionable cloths (and not vice versa). -As for C and F, the intend is to promote sensuality. The way the woman is holding the fruit conveys sensualism and exoticness..= C and F makes you hot.